For the past few years when I’ve attended a Major League Baseball game, I’ve “checked in” using the MLB Ballpark app. It’s been a great way to keep track of the games I’ve been to. I recently noticed that you can manually add past games you’ve attended, going back decades. I thought it would be a great idea to try to remember all the games I’ve attended over the years, so I rummaged through boxes in my attic for tickets (as well as rummaged my old brain for memories), asked others who attended for their memories, and looked through some old photos as well. 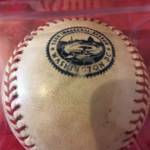 Below is a listing of all the games I’ve attended (Major League only). I’ve included pictures I took at the games (or of my ticket) – you can click on any picture see the full version. Apparently, I didn’t own a camera between 2000-2007. Note that the scores link to the boxscore for the game. 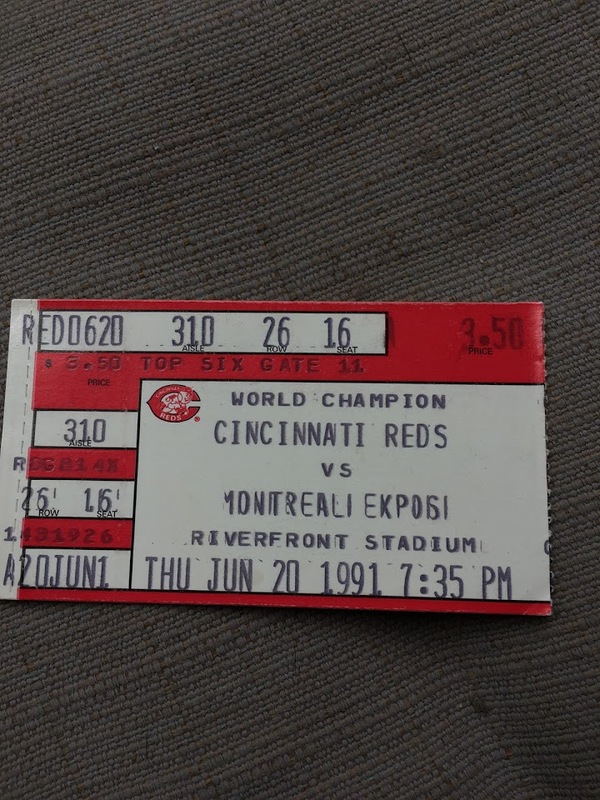 Notes: This wasn’t my first-ever game, but it’s the first one I have evidence attending (see ticket at left). 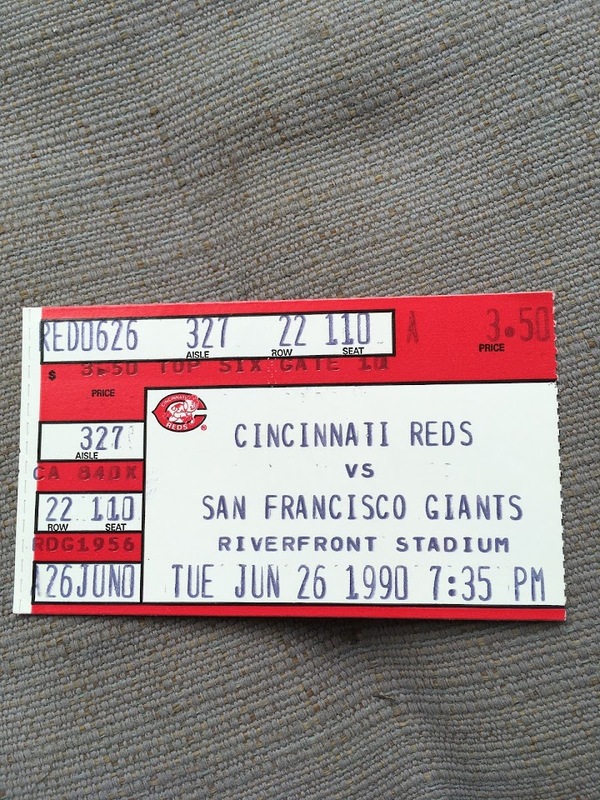 A few things noteworthy about this game: It was one of the last managed by Pete Rose (who was banned from baseball less than two months later), it included a home run by one of my all-time favorite players (Eric Davis), and it also featured the only career home run by Tim Birtsas, a relief pitcher for the Reds. 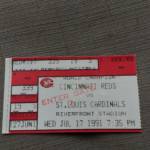 Notes: I don’t really remember this game, but it also featured an Eric Davis home run (I must be good luck!). It was also a 12-inning walk-off, before “walk-off” was a thing. I have no idea if I stayed until the 12th inning, though. 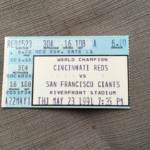 This was the year the Reds won the World Series, so I can say I witnessed at least part of that in person. Notes: I remember getting nervous during this part of the Red’s wire-to-wire championship run, as they started scuffling. This game was part of a 5-game skid. 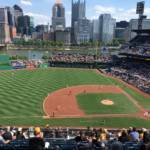 Notice that Pirates won this game – an unfortunately common theme in my ballpark travelogue. Also, Barry Bonds hit his 108th career home run in this game, on the way to becoming the (tainted) all-time home run king. Notes: This was a miserable season for the “World Champion Cincinnati Reds” (as the ticket proudly proclaims), falling to 5th place in the NL West. However, they entered this game 17-17, so there was still hope. Nothing really of note happened at this game. Notes: Attending this game just four days after the last one, I still held out hope for the season. And, in fact, the Reds were 20-18 after this game. The Giants were awful, at just 12-28 at this point. Jack Armstrong pitched a complete game, and Paul O’Neill hit a home run. Notes: I distinctly remember seeing the Expos in person, so I was glad to find this old ticket as proof. 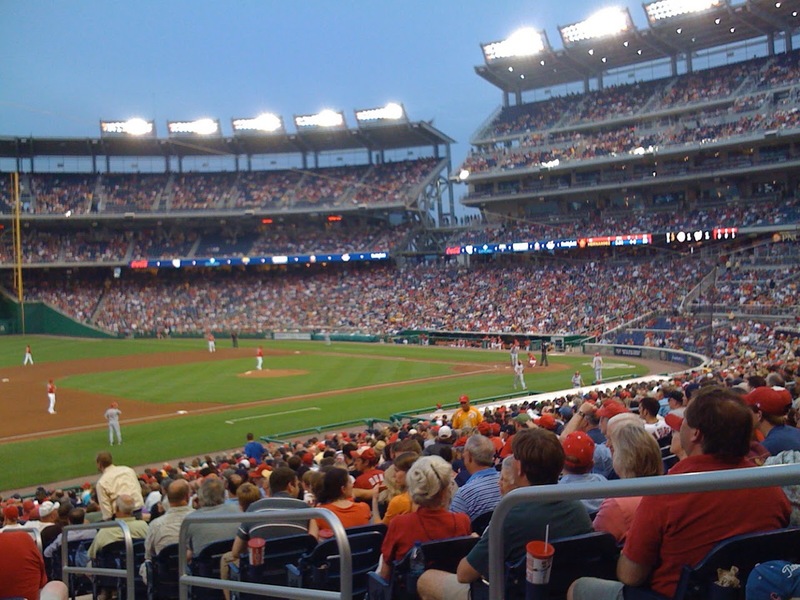 Although I love the Nationals, and lived in DC when they first arrived, I really wish the Expos still existed. 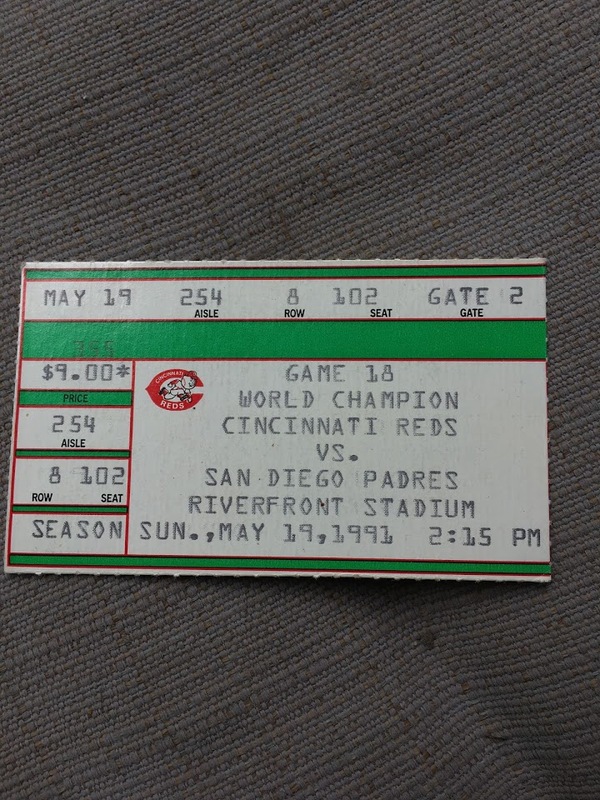 The Reds were still over .500 (34-31 after this game), but they laid an egg in this one, unable to score in 11 innings, squandering a solid performance by starting pitcher Jose Rijo. 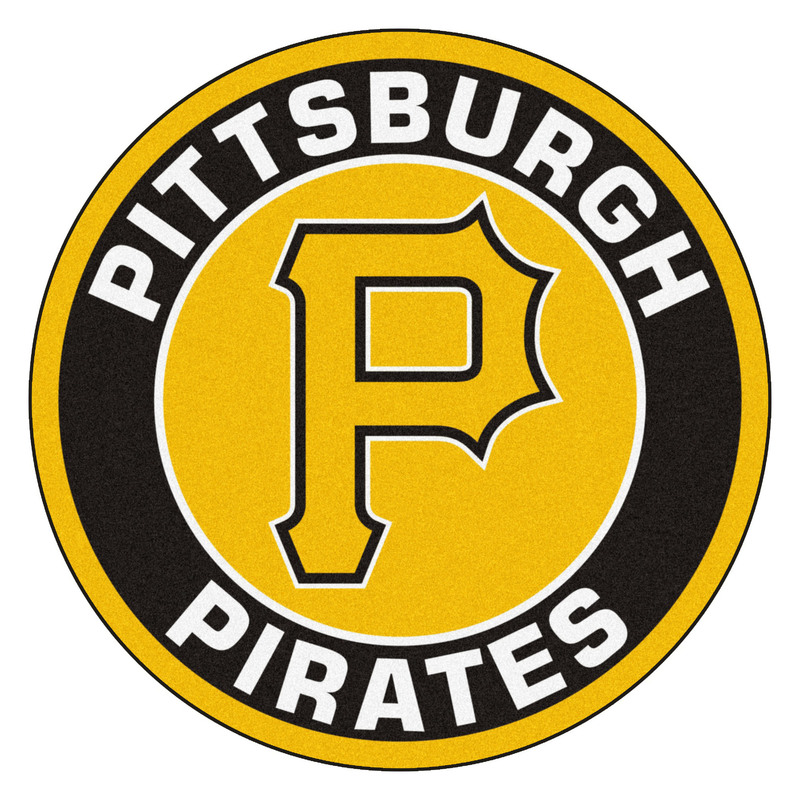 Notes: Another victory for the Pirates, and another home run for Barry Bonds. At least Eric Davis also hit a dinger! This was close until the 6th inning, when Randy Myers decided to be decidedly non-Nasty on this day. Notes: This is the fifth game I attended in 1991, which was a personal record…until this year (2017). I was friends with Joe Torre’s nephew, and he got us tickets for this game against the Torre-managed Cardinals. Unfortunately, Jack Armstrong wasn’t as good as when I saw him earlier in the year, giving up six runs in 4.2 innings. Notes: Yay – a picture from the game! That lovely lady is my wife, and also in the picture (although hidden) is my daughter Lucy, who was comfortably inside my wife’s womb. 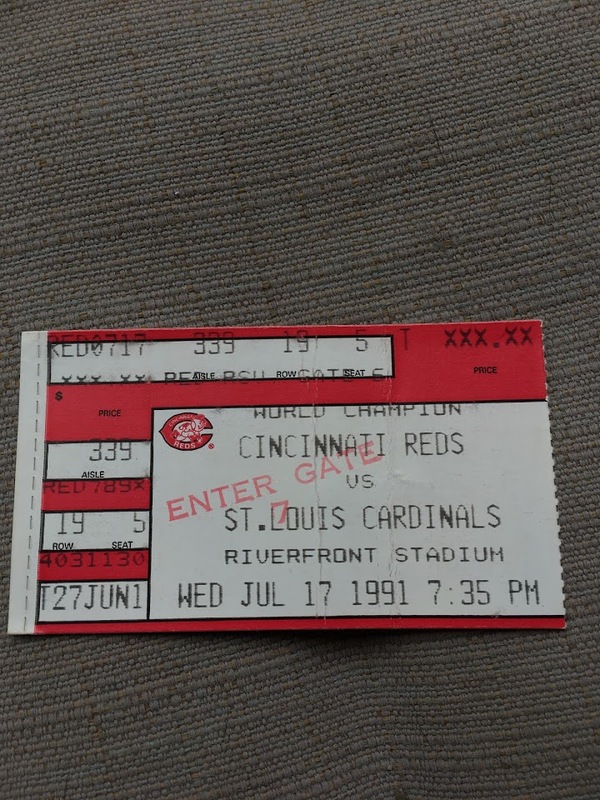 Although this is the first ballpark outside of Riverfront on my list, I actually went to a game at Seattle’s Kingdom and Baltimore’s Camden Yards two years previously, but I can’t remember the dates of those games. 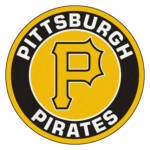 Unfortunately, the Pirates won (yet again), and there was little interesting to remember from the game. 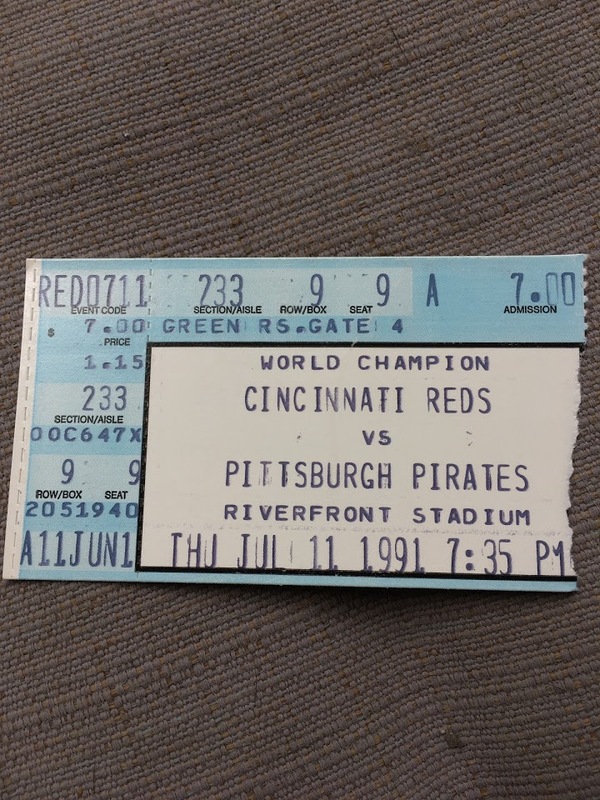 Notes: I was living near Pittsburgh between 1997-2000, and my office-mates knew how excited I was when Ken Griffey, Jr. was traded to the Reds before the 2000 season. 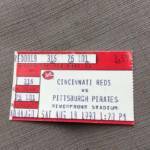 So they organized an outing to a Reds game in Pittsburgh that season. Junior did play and got a RBI, but of course, the Pirates won (notice the trend). I’m starting to think they should take me along as a lucky charm. Notes: I remember this game well because my wife and I went to it to celebrate our 10th anniversary! What’s that, you say? Not everyone goes to Cleveland for their anniversary? Well, Cleveland had something most cities don’t have: someone to take care of our four children, ages 1-8, for the weekend. The game itself was kinda a dud, however, as it included about 2 hours of rain delays, and Jacobs Field didn’t allow you to bring in umbrellas at the time. Notes: Yes, RFK Stadium. 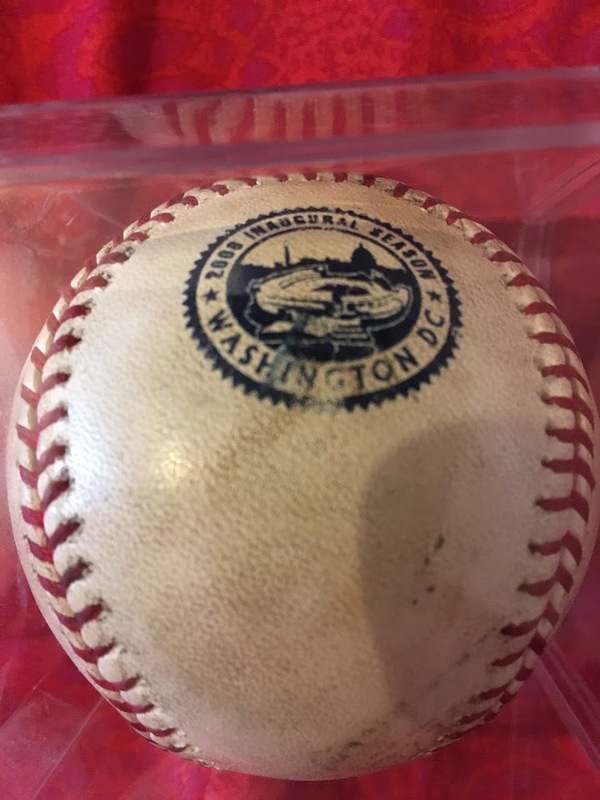 When the Expos moved to DC and became the Nationals, they played their first three years in RFK, the former home of the Washington Redskins. The stadium was a dump, and I could smell sewage throughout the game. 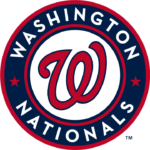 The Nats were surprisingly decent this year, finishing .500 (which was amazingly only good for last place in their division). 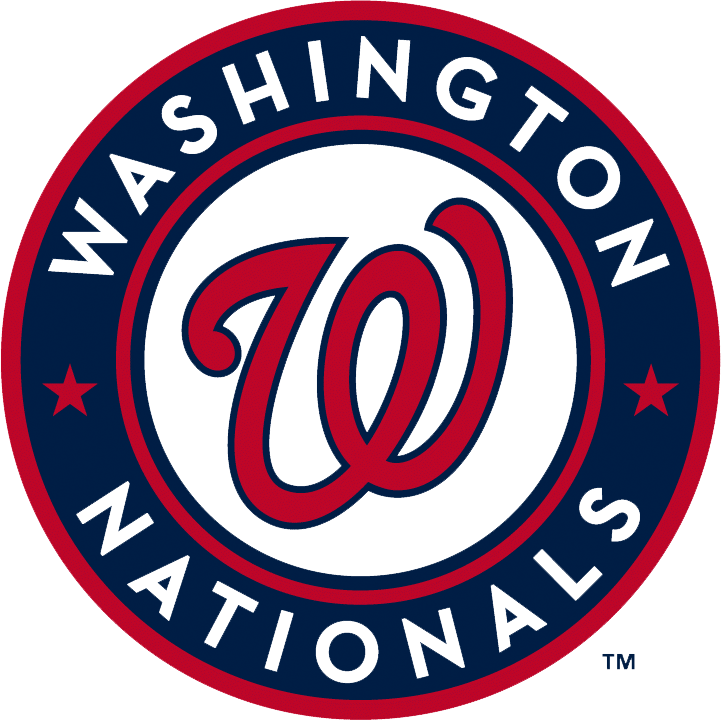 Although my first love is for the Reds, I actually rooted for the Nats at this game, since they were in a playoff race and the Reds were out of it. This greatly annoyed my wife, who was more loyal to our home team. The game itself was pretty forgettable. 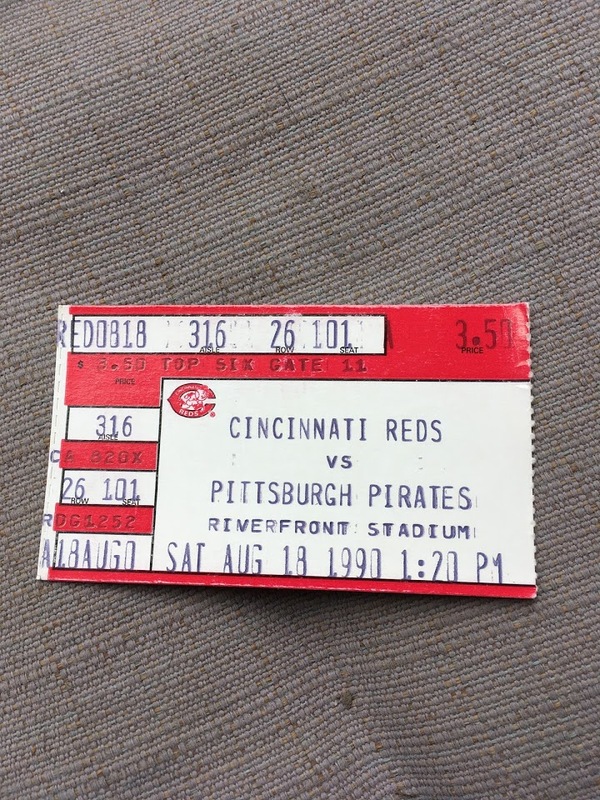 Notes: This game was distinctive for two reasons: It was Homer Bailey’s major league debut, and was the first game attended by my four oldest kids (well, my daughter Lucy did attend that Pirates game in utero). 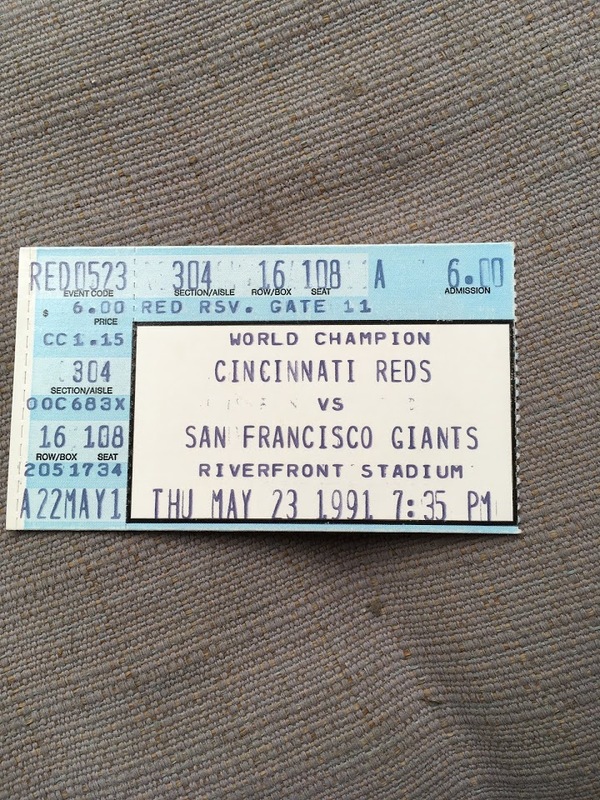 It was *not*, however, my first game at Great American, which you might think from this list, since I attended a game there previously with my dad, but I can’t remember the date (or even year) of that game. 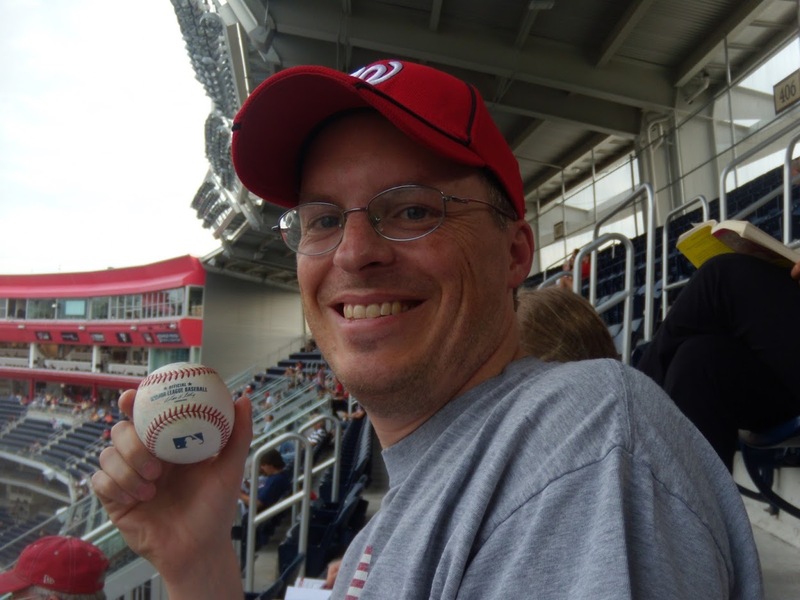 Notes: Most noteworthy about this game: it was the first (and still only) time I caught a foul ball (which you can see in the picture to the left). 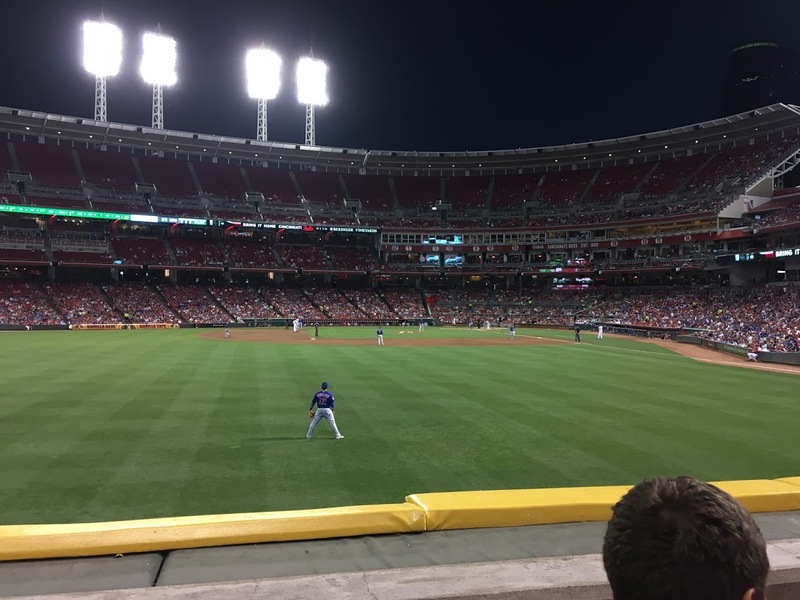 I was up the third-base line, and a ball – hit by Joey Votto – landed in the aisle next to me, bounced, and I quickly grabbed it from the hordes scrambling for it. A little boy in front of me asked me for it, but since I’m a jerk, I didn’t give it to him (I planned to give it to my own son, which I did when I got home). Votto also had a home run in this game, only the 18th of his career at that point. The Reds weren’t good in 2008 but this game featured the young foundation of their future playoff run: Votto, Jay Bruce, Brandon Phillips, and Johnny Cueto. Notes: Two bad teams playing a forgettable game. Notes: This was part of the most exciting year for Reds baseball since the 90’s, and they finally made it to the playoffs after a 15-year drought. 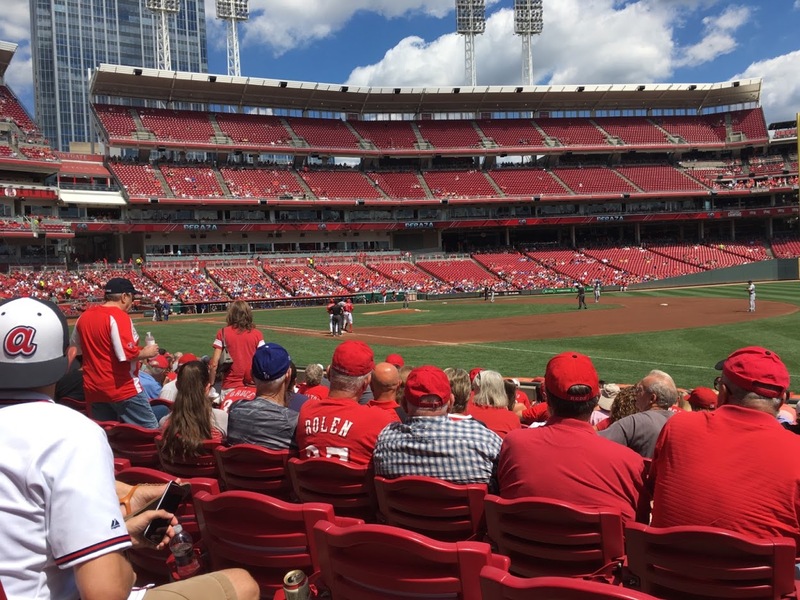 Of course, I ended up going to one of their losses, which shouldn’t be surprising considering how badly the Reds play when I’m in attendance (see below). 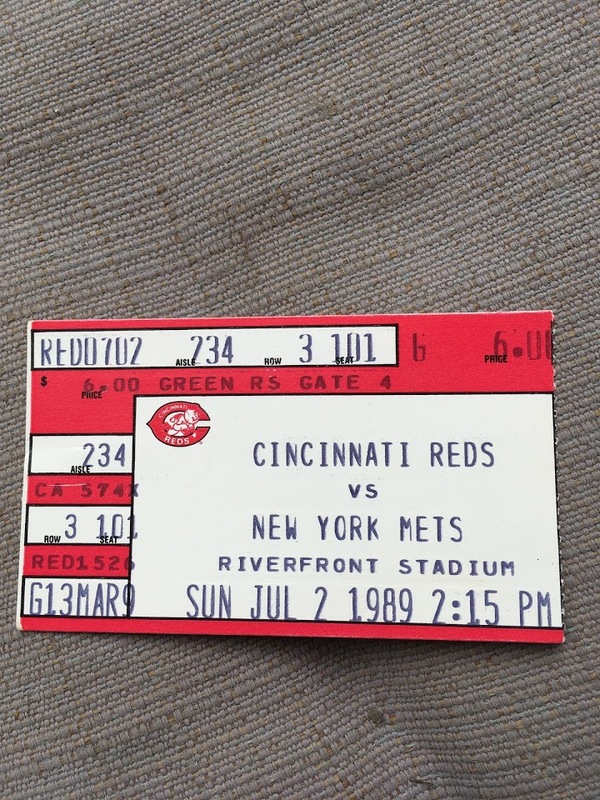 I had four free tickets to this game, took my son and daughter and gave the fourth ticket to a stranger on the subway. 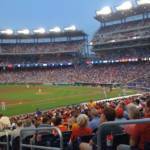 They were good seats, but we found that Nationals fans don’t mind walking up and down the aisle during play, which greatly annoyed my son. 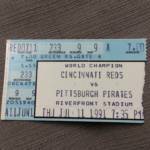 Notes: I went to this game with my son and some friends. It was a battle between a bad team (the Nats – 33-41 going into the game), and a terrible team (the O’s – 22-51 going into the game). Unfortunately, the O’s won, but I don’t remember much else about the game. Notes: The ball I’m holding in the picture on the left I got during batting practice before the game, when Jason Heyward threw it to me in the stands. 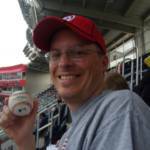 I got tickets for this game at the last minute, so we could watch Stephen Strasburg – the phenom who recently had been promoted – pitch. However, he was a late scratch and would soon have Tommy John surgery. Sigh. At least the Nats won. 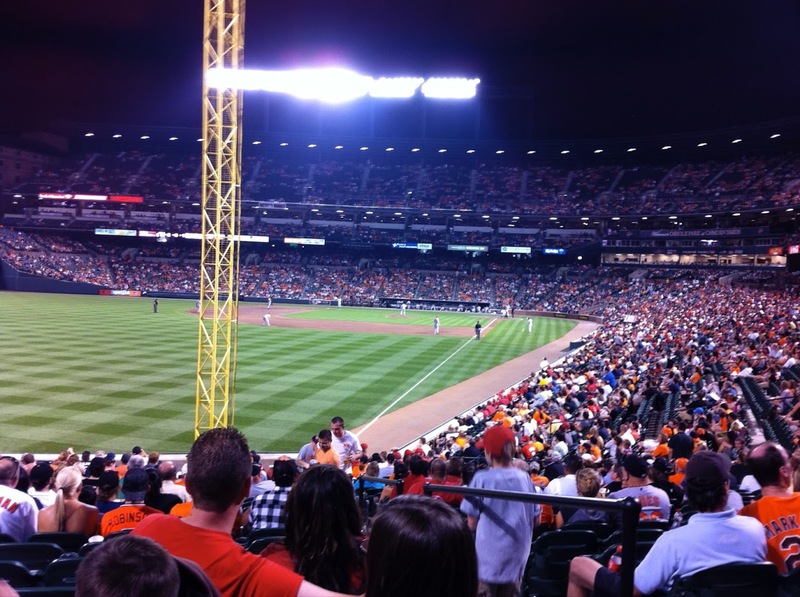 Notes: When we lived in Maryland, a family we were close friends with were die-hard Orioles fans, and we often good-naturedly kidded each other about our respective teams. 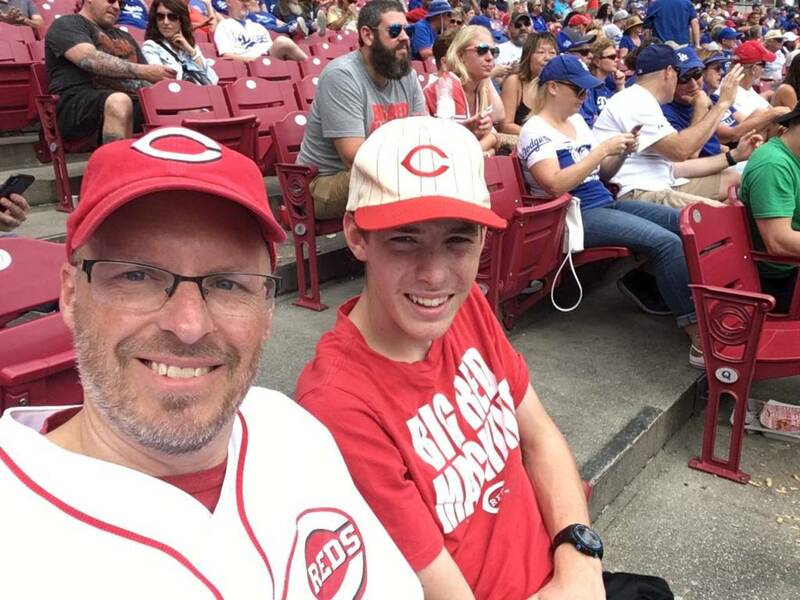 When the Reds came to town, we had to attend one of the games together. It was a dinger-fest (eight total home runs! ), and fortunately, the Reds came out on top. Also exciting was moving down near the field in the 9th inning to see Aroldis Chapman mow down three straight batters with some serious heat. 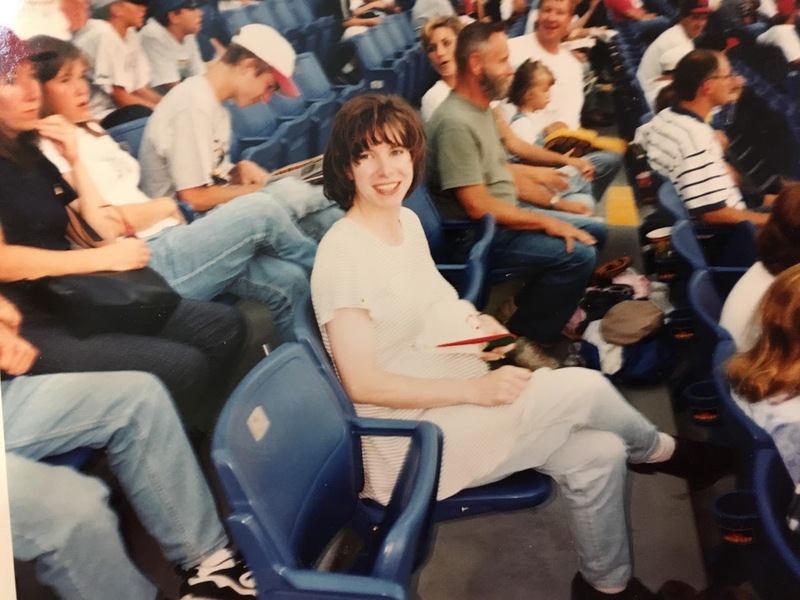 Notes: This ballpark travelogue could also be my family’s moving history, as you can see what area of the country we live in based on the games we attended. 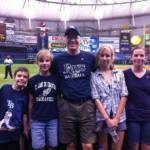 We moved to Florida in the summer of 2011, and before I even started work I took my kids to a Rays game at Tropicana Field. I was taught to only say something if I have something nice to say, so that’s all I’ll say about Tropicana. We did witness first-hand a very rare event: a Jose Molina triple (he has three in his 15-year career). 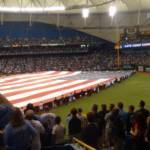 Notes: When we first got to Florida, we didn’t have much to do, so we went to a few ball games at the Trop. 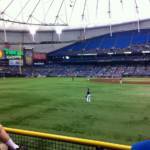 In this game, I got to see one of my favorite players – Josh Hamilton – although he didn’t do much. Also saw an Evan Longoria home run, so that was nice. 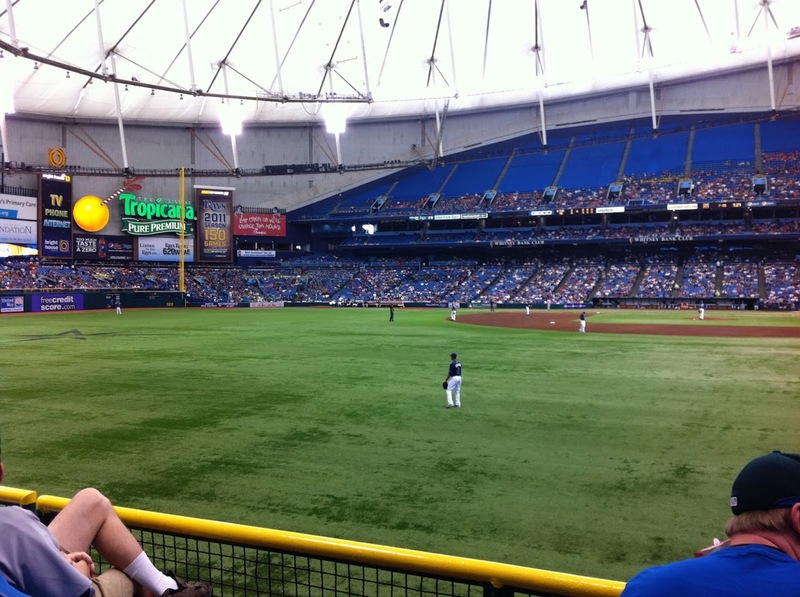 Again, though, the less said of the Trop, the better. 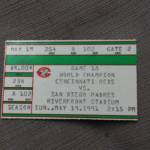 Notes: This was the first (and still only) playoff game I’ve ever attended. 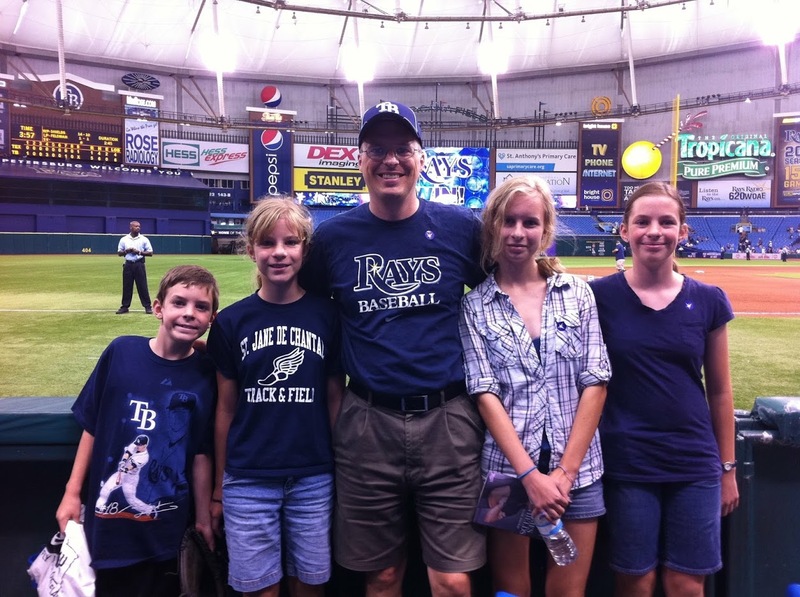 Even at the Trop – a depressing place to watch a game – the atmosphere was electric. I’ve never been to a game where you stood almost the whole game. 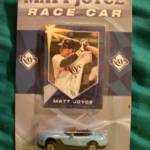 Unfortunately, the Rays dropped this game – Game 3 of the ALDS – and would lose the series in the next game. Since I now live in Cincinnati, I won’t have many chances to attend another playoff game for a while, unless I decide to travel upstate. 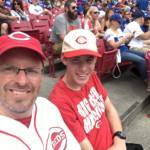 Notes: We were visiting family in Cincinnati during this week and decided to catch a game with some of them. As I sat down in my seat, I turn to the person in the seat next to me, and it was one of my best friends from high school! You would think Cincinnati was a pretty small town to have that happen, but it’s not. We got to see the knuckleballer R.A. Dickey during his Cy Young season, and even better, got to see him get beat by the Reds! Notes: On a whim, I decided to make a “Cincinnati Sunday” while we were living down in Florida. 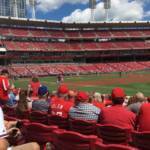 We left at 9am for Miami, drove the three hours to watch the Reds at Marlins Park, then got some Skyline Chili (there’s one in Miami! ), then drove three hours back home. 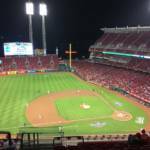 It was a great game, going extra innings, with the Reds winning. Also, the picture to the left is a screen shot from the Reds television broadcast: in-between innings they showed us, and I was dumbly looking at my phone. 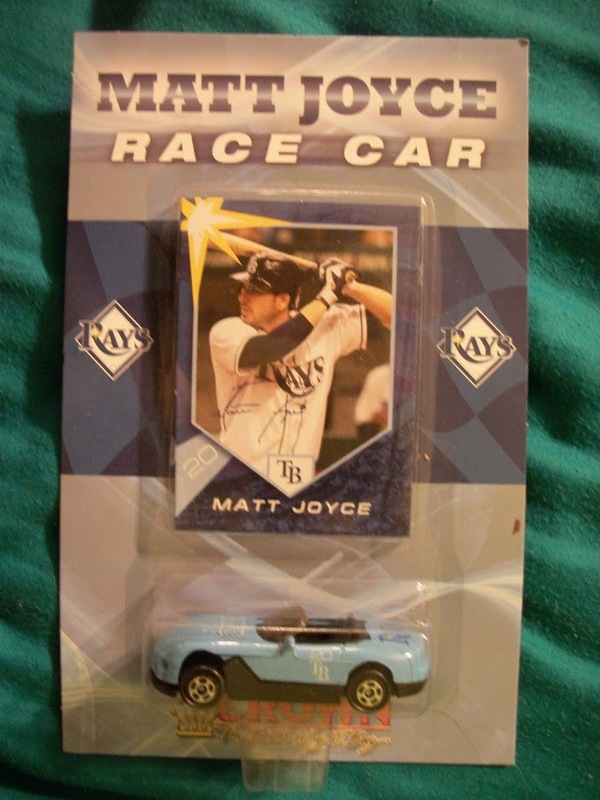 Notes: You know when the best thing about a game is that it’s “Matt Joyce Race Car” giveaway day, it’s not much to write home about. Again, the Trop. Notes: For our kids’ 12th birthday, the same-gender parent takes them out for a weekend. 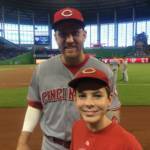 So when my son turned 12, I took him to Miami to catch a few Reds’ games against the Marlins. 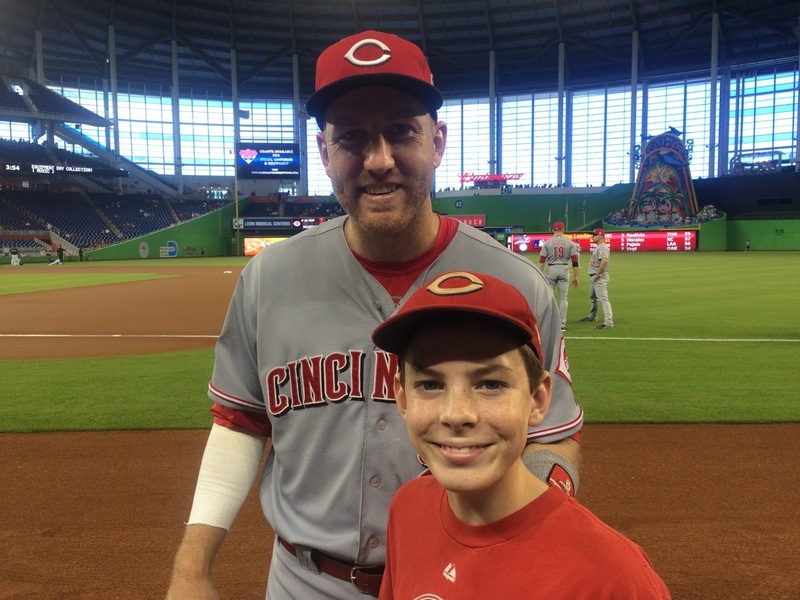 We got good seats for the first game and arrived early for batting practice, and my son was able to get an autograph from Todd Frazier and get his picture taken with him (see picture at left). 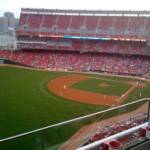 This was just days before Frazier won the Home Run Derby back in Cincinnati. 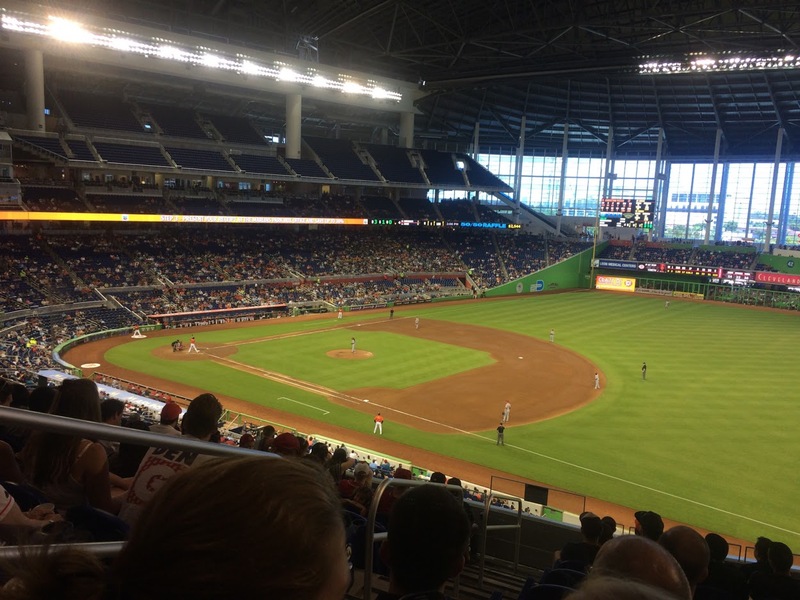 The game itself was dreadful, as at one point the Marlins got nine hits in a row, on their way to 21 hits and 14 runs. Ugh. Notes: The next day wasn’t much better. 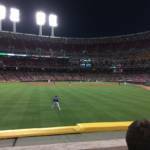 Actually, it was worse: we had worse seats and the Reds lost big again. But to be honest, we still had a great weekend! 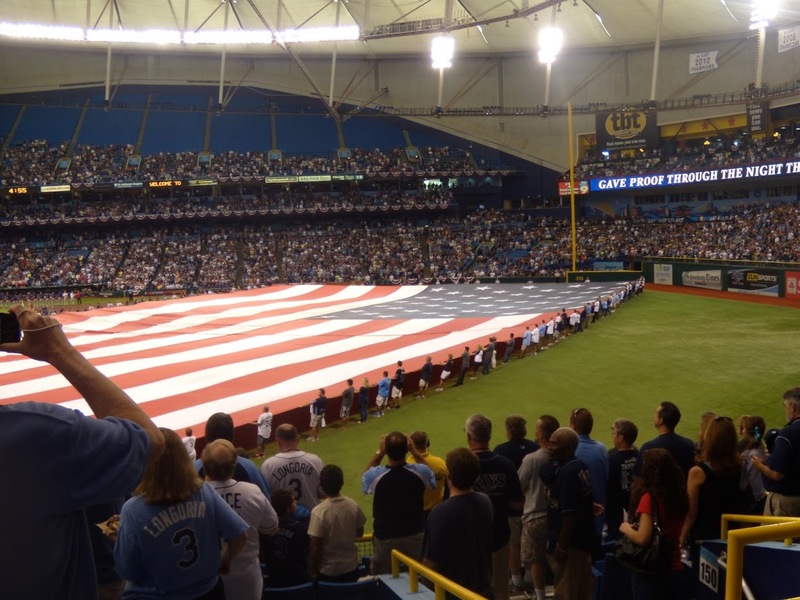 Notes: The Trop was the only ballpark where I’ve seen a playoff game, and it’s also the only park where I’ve seen an Opening Day game. While not as exciting as a playoff game, it was pretty cool to be there. Unfortunately, Chris Archer’s performance was a microcosm of his whole season: a lot of strikeouts, but he got the loss. We did get to see Corey Dickerson’s first HR as a Ray, if that means anything (it probably doesn’t). Notes: Like I mentioned above, this could also be my family’s moving history, and this game represents our first game after moving back home to Cincinnati. It was a slugfest (most of the slugging was by the Dodgers, unfortunately), and we got to see three home runs by Adrian Gonzalez and the first career home runs of both Andrew Toles and Rob Segedin (thanks, Reds pitching!). The highlight, however, was seeing Reds position player Tyler Holt pitch a 1-2-3 inning! 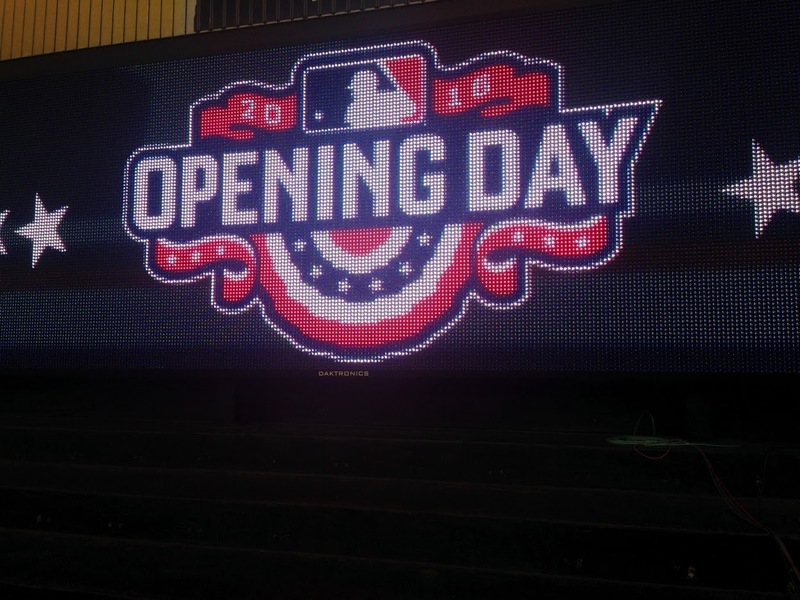 Notes: I’ve only been to one Opening Day, but this was “Opening Night,” which is kinda a thing in Cincinnati. I got free tickets, which you can see from the picture to the left were located somewhere in Dayton, Ohio. I actually liked the view, as I got to see the whole field and how plays develop. This might have been the fastest game I’ve attended, as (after an initial rain delay) the game went only 2:25. 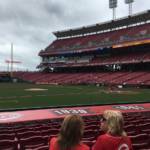 We saw a Joey Votto home run and a great pitching performance by Brandon Finnegan. 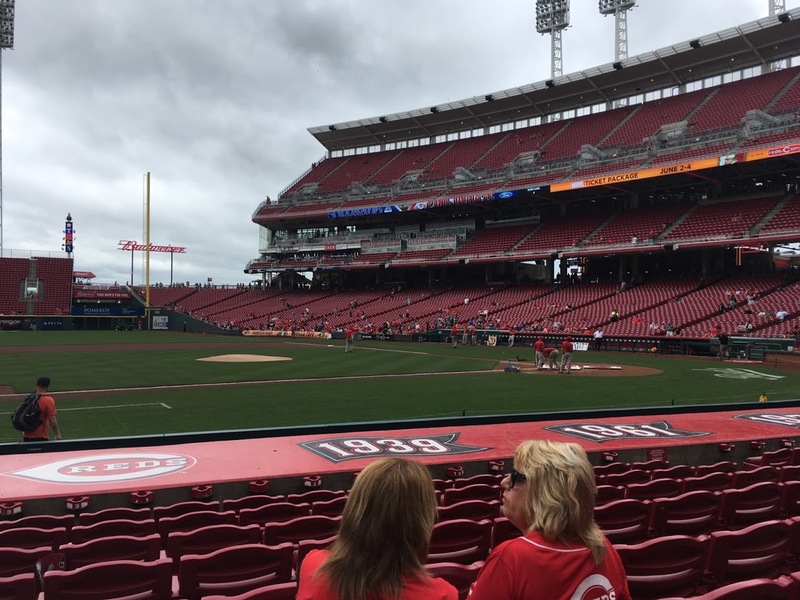 Notes: After the nosebleed seats for the previous game, a friend was able to get seats right behind the third-base dugout for this game, which gave us a better view of another Joey Votto home run. I normally like seeing pitchers who rake, but I wasn’t thrilled when the Rockies pitcher went deep off Bronson Arroyo, who was pitching one of the last games of his career. 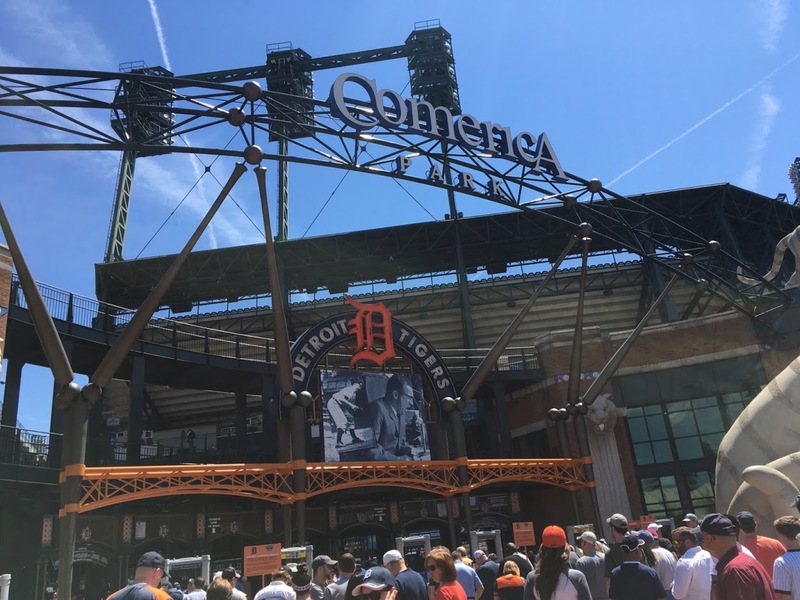 Notes: This was Day One of the 2017 Baseball Road Trip I took with my son and daughter. 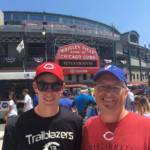 Three days, three games, three ballparks. 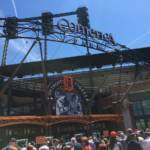 First up was Comerica Park in Detroit. I liked this ballpark, although I’ll admit the game was a bit boring (I’m not really invested in either team). By far the biggest disappointment was that Mike Trout had just gotten injured and didn’t play in this game. My son did accurately predict a home run at one point, which won him $5 from the lady sitting next to us. Notes: 2017 Baseball Road Trip, Day Two. I’d been to Progressive Field before (then known as Jacobs Field), and like my previous trip, there was a rain delay. 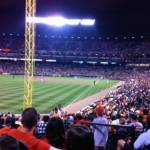 However, my sister-in-law, who lives in Cleveland, got some great seats close to the field and behind home plate. 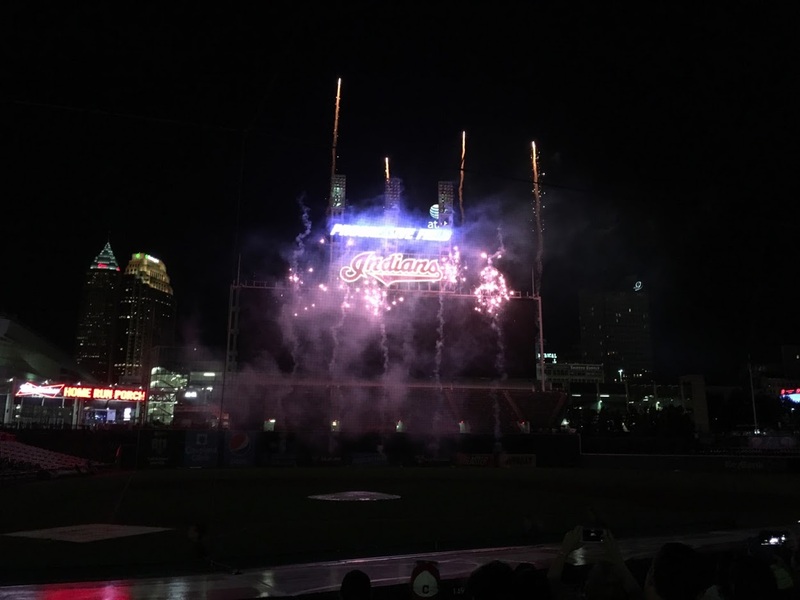 Of the three games in our Baseball Road Trip, this was definitely the most exciting, as the Indians are American League Champions and everyone is pumped about them this year. Plus the NBA Playoffs were going on right next door, which added to the excitement. 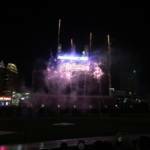 Fortunately, the Indians won, and we got to see a great fireworks show afterward. 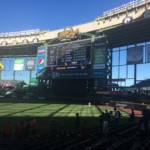 Notes: Third and Final Day of my 2017 Baseball Road Trip. 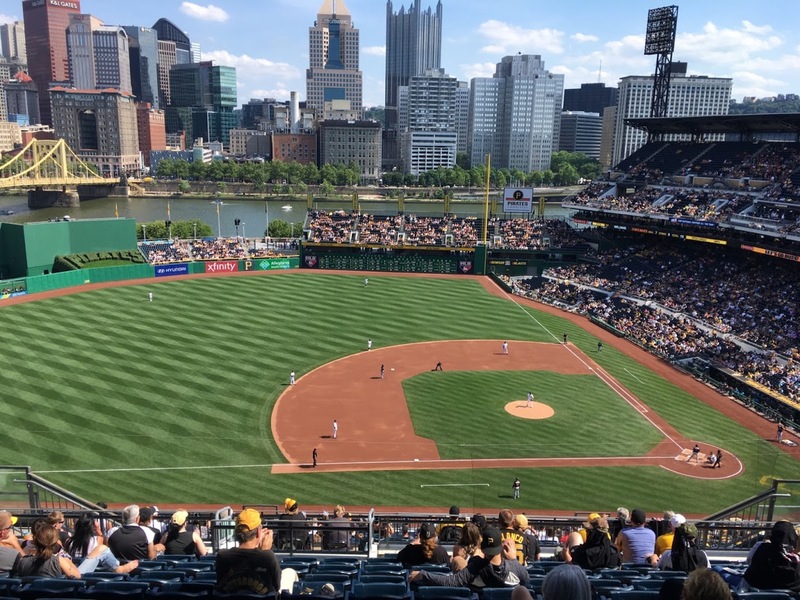 Everyone raves at how beautiful PNC Park is, and they are right. The views are great, and the park has an intimate feel. However, I actually like Progressive Field better, mostly because their scoreboard is far more informative for a baseball stat geek like me. 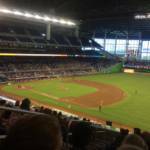 My kids and I were excited about seeing Giancarlo Stanton in person (he was always injured in past Marlins games we’ve attended). So, of course, he was injured in his first at-bat and came out of the game. He was replaced by Ichiro, so that made the pain sting a bit less. Notes: Attending this game broke my record for most games attended in a season (and there’s still time to extend that record before the season is out). This was an exciting game, and we were able to witness a walk-off Reds victory, which I filmed and you can see in the video to the left. Notes: This game had an inauspicious start. I was surrounded by Cubs fans, one of them vomited in the first inning, and the Reds were down 9-0 after four innings. 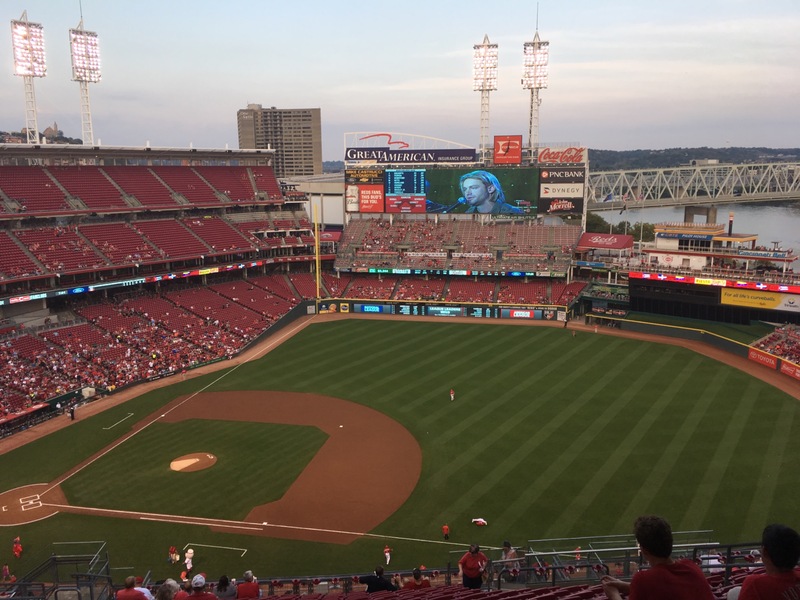 However, the weather was great, and the last inning – when the Reds hit three home runs – was like ending a round of golf with a great shot. It makes you want to come back for more! 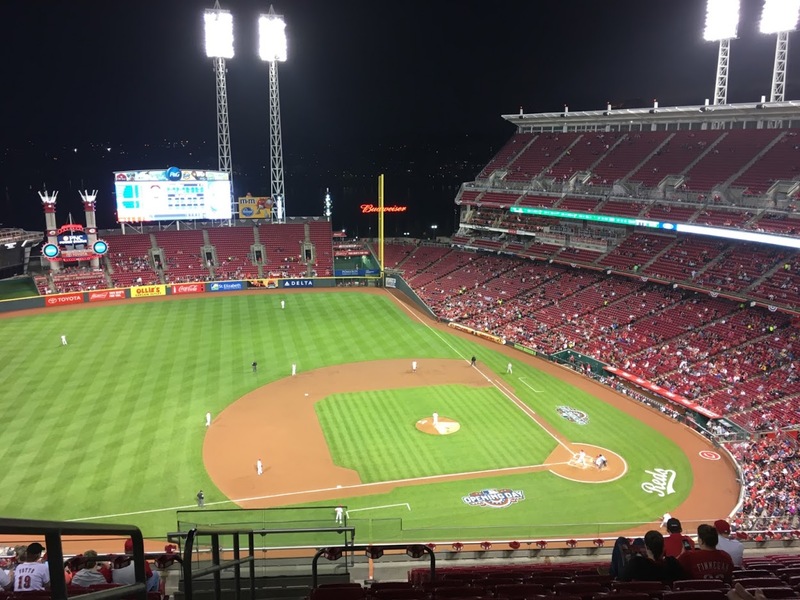 Notes: At this point in the season, the Reds were far out of contention, but I thought it’d be nice to see one more game. Add the fact that I hadn’t seen the Red Sox in person before, and it seemed like a nice thing to do with my son and daughter on a Friday night. 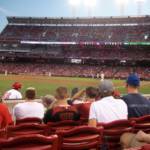 The game was relatively forgettable – Billy Hamilton was caught stealing, but that’s about all I remember. But it was a nice way to close out the year: it was my eighth game in attendance for the year – a new record! 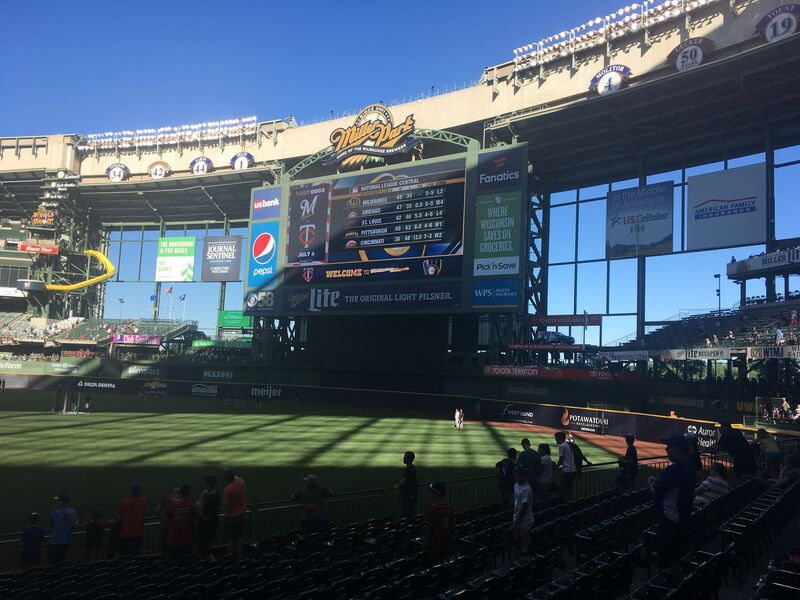 Notes: My son and I were in Wisconsin for his baseball tournament, and were able to swing by both Miller Park and Wrigley (see below) on the way back. This added two ballparks to my list and two teams I’ve never seen (the Brewers and the Twins). I liked Miller Park, but it is in a weird place – at the intersection of two major highways and surrounded by a huge parking lot. There’s nothing around the Park other than the lot, which is probably why most people tailgate beforehand. The game was exciting – a walkoff walk for the Brewers. Notes: Finally made it to Wrigley! 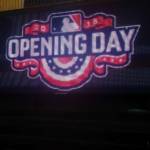 This is a must-see for any true baseball fan, so I’m glad I was able to get there. 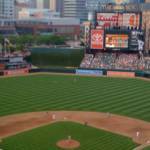 The ballpark is quite unlike modern ballparks – from its location to its overall feel. It’s smack in the middle of an old neighborhood (we parked in some guy’s driveway). The biggest thing I noticed about the park itself is how many seats are far under the upper stands so you can’t see fly balls after they leave the bat. 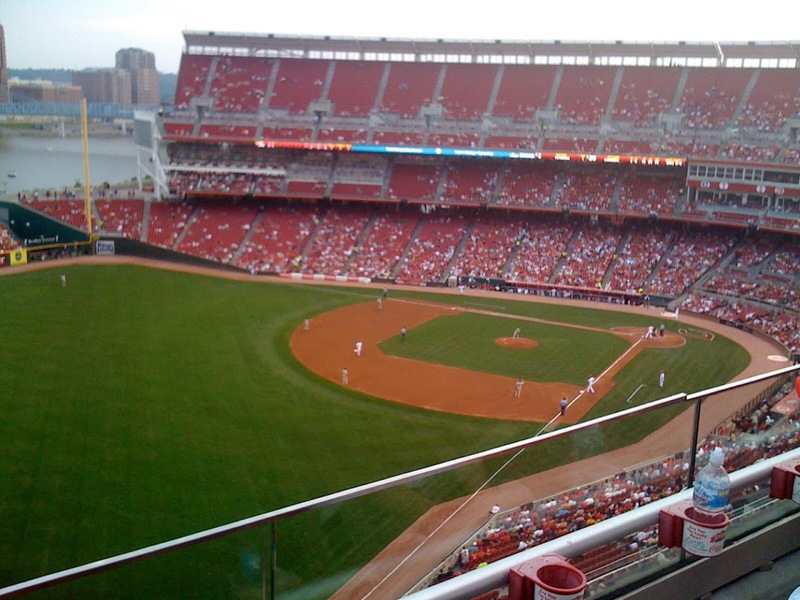 Perhaps that’s why so many fans cheer like it’s a home run for any fly ball – they can’t see it! I also noticed that a game at Wrigley is much more of an “event” than a ballgame. Lots of people there seemed to be casual fans at best; they were enjoying the atmosphere more than anything. 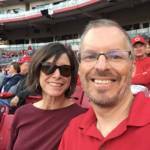 Notes: It took me a while to get to my first game at GABP this year – there was little to be excited about with the Reds, and I’ve had a busy summer. But for my daughter’s 9th birthday I promised her a trip to the ballpark, and so we had to come! 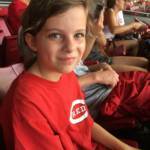 This was her first-ever visit to a Major League (regular season) game! 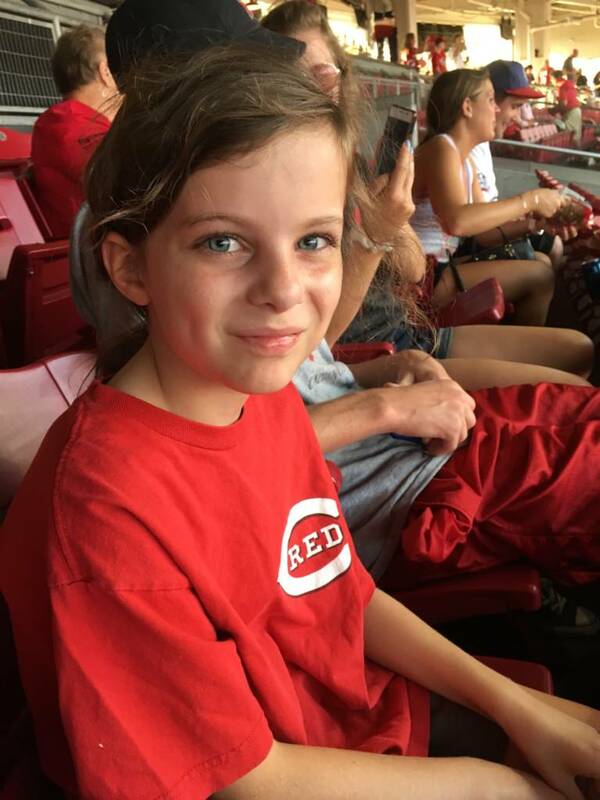 Even though the Reds lost (of course), she enjoyed it greatly. Notes: I didn’t plan to come to the ballpark again this year, but I got free tickets, so who can turn those down? They were also very good seats, which was nice. The game was awful, though, which wasn’t nice. Notes: More free tickets! 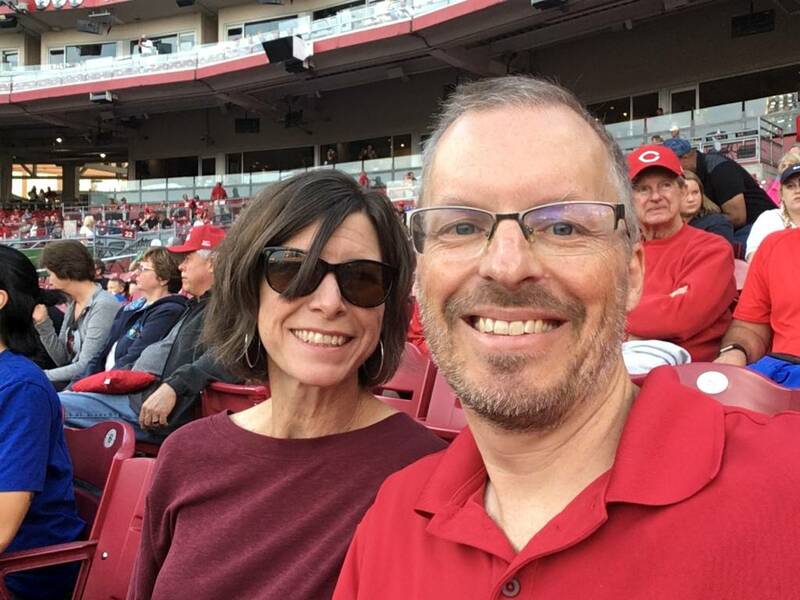 Although the game was another miserable affair for the Reds, this was a great night, as my wife and I went out to dinner beforehand, the seats were great, and the weather was perfect. It was also the first time I’ve seen the Royals in person, which checks another team off the list. 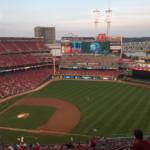 Depressing fact: in the three Reds games I attended this year, the Reds were outscored 24-5. Ugh. 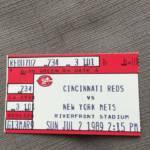 1980-1988: I attended approximately one game a year at Riverfront Stadium in Cincinnati during these years. 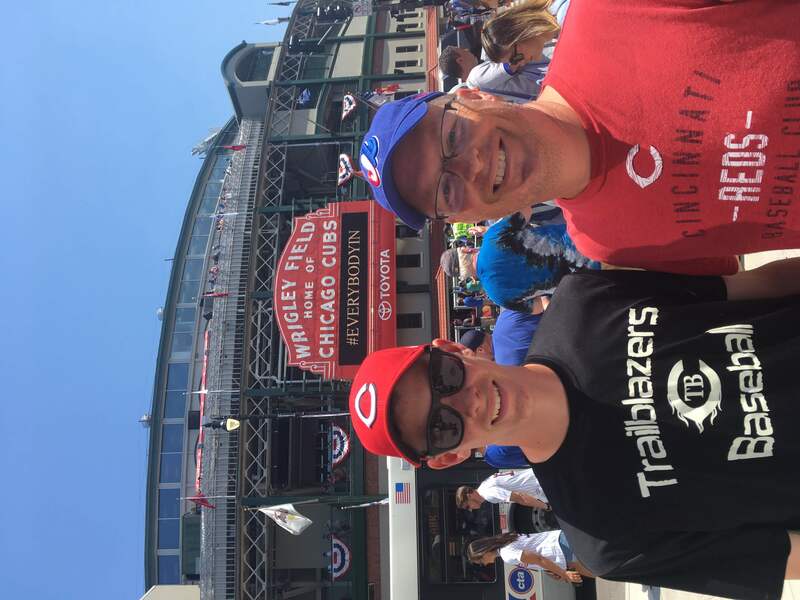 Each year I would receive free “good student” tickets, and I’d go to the game with my dad. I might have missed a year or two, but I probably attended around 6-8 games during this timeframe. 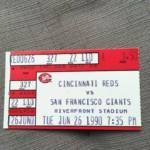 1996: I went to a game at the old Kingdom when I was in Seattle on business. But I can’t remember the date, nor who the Mariners were playing. 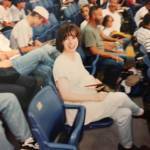 1996: I attended a game at Baltimore’s Camden Yards with my wife and her sister and brother-in-law. They were playing the Mariners (I loved Ken Griffey, Jr., btw), so that narrows it down to six dates, but I’m not sure exactly when we went. 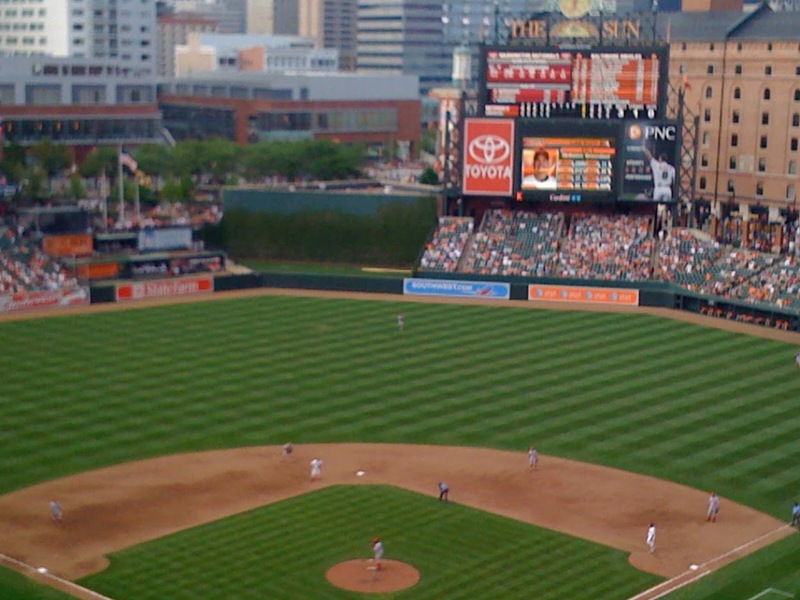 Late summer 2000: I attended a game at Camden Yards with a business associate, but I can’t remember the date or the team the Orioles were playing. 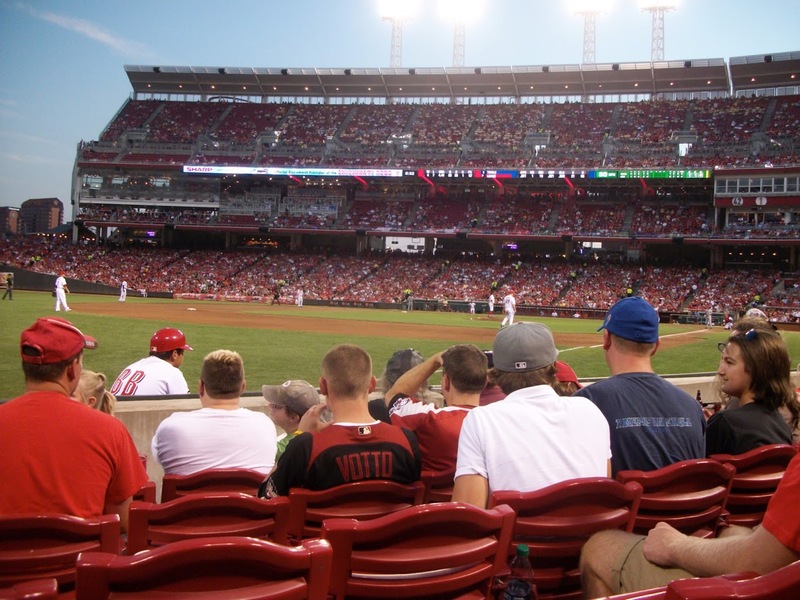 Between 2003-2006: I went to a game at Great American Ballpark in Cincinnati with my dad at some point in the mid-00’s, but I can’t remember the year or the visiting team. I can remember where our seats were, however (1st base line, about 20-30 seats up). 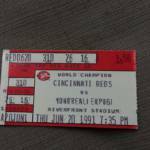 This was my first game at Great American. That’s about 10-12 games I’ve been to that aren’t listed above. All I can say is: I’m sorry, Reds fans, and you’re welcome, Pirates fans.